In 1991, I visited M.F.K. 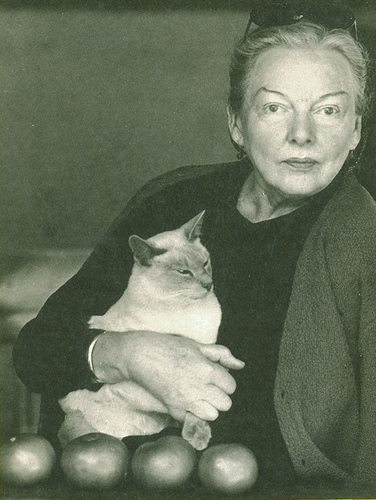 Fisher in Sonoma County, California, where she spent her final dozen years in her lovely adobe “wine country” home, Last House. She was at the time bed-ridden, nearly blind and riddled with debilitating health problems. In fact, she died the next year. But I had come to interview her for an article to be published in dozens of newspapers, and she was up for the occasion. Charming, sharp, witty and ever the gracious hostess who directed her caretaker to serve wine, she concluded the interview by inviting me to visit her bathroom. There, in addition to tile floors and a huge tub, she also had large shelves to store her hundreds of books. “Pick the one you want,” she directed. 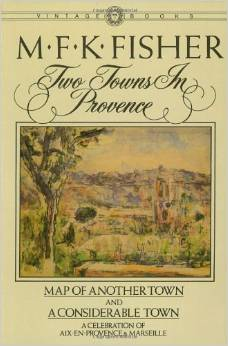 I chose “Two Towns in Provence,” published in 1983 from two previously printed books. She signed it as best she could with a shaky hand, adding a little heart. It remains one of my prize possessions. Of course I read it with pleasure, being an enormous fan of not only her insights on food, cooking, culture and life, but of her wonderful writing. 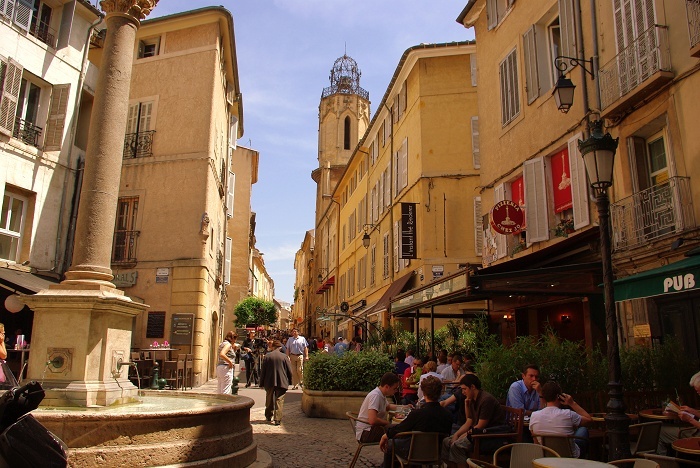 The towns in question were Marseille, which I knew only slightly, and Aix-en-Provence, which I had never visited. But their characters, sounds and smells, the quality of their light and music were vivid to me as enticing portraits of exotic and foreign lands. Now, seventy-some years after M.F.K. first spent time in Aix—and by her own admission, fell in love with it—I find myself living here and experiencing my own heady romance. Of course, I brought her gift to me along, and step-by-step, street-by-street, she has been my mentor and my guide. In many ways, the roughly five years she spent here with her two young daughters (coming and going) between 1955 and 1962 are very distant and reflect the era that was just emerging from World War II. The Aixois were in those years, she wrote, “basically defeated. Exhausted.” But they became younger every time she returned. Much of what she describes appears unchanged—from those times and, indeed, from centuries before. 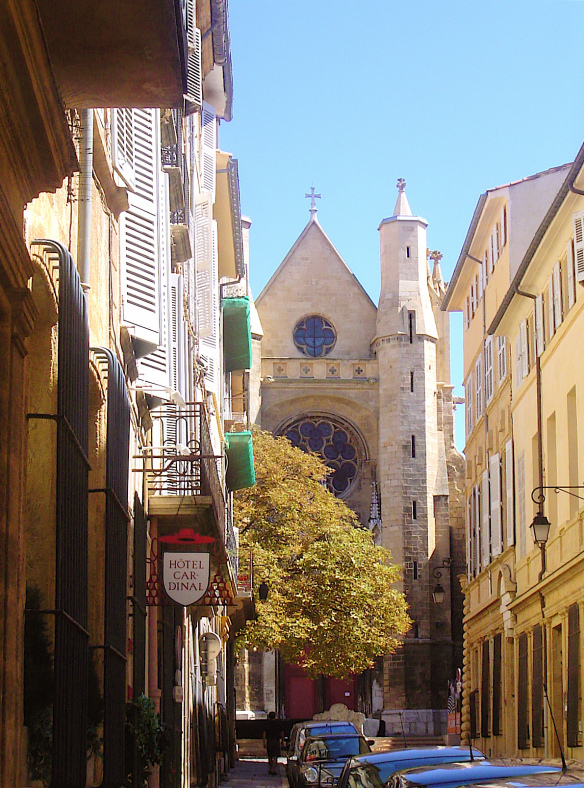 So it is easy to walk past the Cathédral St.-Sauveur and expect to see her coming out. Or to follow the narrow, medieval street, Gaston de Saporta, and imagine coming across the bookstore of the larger-than-life Brondino, whose outspoken beliefs and left-wing views got him booted out of his job as a law professor. Whereupon he established himself in his bookstore and foisted his radical views– and art reproductions–on the students who still flocked to hear him. And, on the other side of town, in the heart of the exclusive Mazarin District, it is impossible to pass by the stately golden-toned walls of the 17th century mansion at 17 rue Cardinale and not see M.F.K. slipping out the richly carved wooden door; or the principal maid Fernande, given to “liver crises”; or the incomparable landlady, Mme. Lanes, with her “desperate nobility,” her worn, elegant clothes and perfect carriage, heading to the market near dawn to find the makings of the day’s meal. One of M.F. K.’s indelibly memorable characters, Mme. Lanes embodies a whole era near its end: An impoverished aristocrat worn down by war, loss and deprivation, she was forced to open her home to boarders in order to keep it. And in her struggle to maintain her position, she nearly killed herself trying to preserve a way of life not just of the pre-war era, but, by M.F.K.’s account, to the standards of the 18th century. If Brondino was a Communist, M.F.K. wryly noted, Mme. Lanes was “a Tory”—a woman so bound to a dying class system that she once declared she would rather fall into the Cours Mirabeau, Aix’s elegant main boulevard, than be helped across by a well-meaning woman of the lower rungs of society. It is on the Cours Mirabeau that I think of M.F.K. especially. For it was here, at the famous Deux Garçons Café, that the self-described “ghost-like” writer took breakfast every morning, lingered after her girls left for school, and spent “many of the pleasantest hours of my so-called life.” Nearing fifty, and already a well-known and popular writer on food, cooking and travel, in America, she was indeed invisible in Aix. Although W.H. Auden once wrote of her, “I do not know of anyone in the United States who writes better prose,” even she, author of several best-selling books including an acclaimed translation of Brillat-Savarin’s “The Physiology of Taste,” fell victim to the strange anti-Americanism of the day. I still admire the sangfroid with which M.F.K. replied, smiling politely at the attack and holding her tongue. Only the next day did she reply, by selecting a gorgeous bouquet of flowers and having them delivered to the lady—in a box shaped like a coffin. But if the celebrated writer made her appearance every day at the Deux Garçons, no one seemed to notice. Although anti-Americanism of her day has given way to an enthusiastic embrace of American pop culture in all its forms these days, the “ghost-like” figure seems still to be invisible. 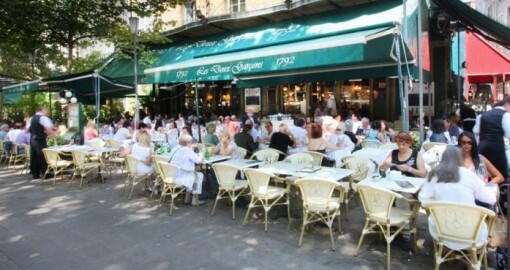 On the menu of Deux Garçons there appears a brief history of the café, dating from 1792. Among the celebrated habitués listed are André Maurois, Jean Cocteau, Jean Giono, Blaise Cendrars, Edith Piaf, Jean-Paul Belmondo, Sophie Marceau and Winston Churchill. Even Hugh Grant and George Clooney get a nod, to say nothing of those 19th century high-school pals, Paul Cézanne and Emile Zola. But M.F.K. Fisher is never mentioned. Wow, that is ridiculous. Even now they don’t recognize her or pat themselves on the back being her home town…Very nice article. Loved your article, Joanna and the photos too are divine. 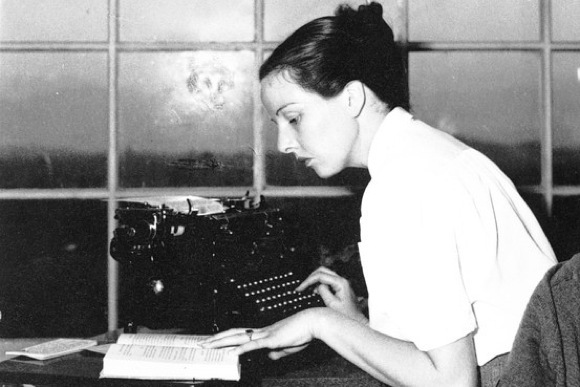 What an extraordinary experience for both you and M.K.Fisher to have shared, as you interviewed her at Last House. And how lovely that you followed in her footsteps in Aix. Having just dined at Deux Garcon Cafe, I really felt her spirit there, thanks to YOU!